This year is the third year Fridley Public School is partnering with The Good Acre to provide students with locally-sourced produce. Delicata squash, a vegetable many students were not familiar with, was one of the farm to school vegetables added to the menu during the 2017-2018 school year. As delicata squash was menued monthly, students became more familiar with it, and delicata quickly became a student favorite across all schools. One of the great aspects of buying from The Good Acre is the initial training and recipes they provide. Staff received culinary instruction on delicata squash at The Good Acre sponsored by Anoka County SHIP. The staff at The Good Acre taught knife skills and proper roasting techniques. They also provided recipes for Fridley Public Schools staff to bring back to their kitchens. While marketing materials were available, students were still unfamiliar with squash. However, their interest was peaked as demonstrated by one of the staff supervising lunch being asked multiple times, “What’s squash?” With a little nudging, students learned to love delicata. While exposing students to new vegetables is beneficial, farm to school practices can also present challenges. Additional staff hours may be needed to prepare some vegetables. Also, unlike mainstream vegetables farm to school produce may not be uniform in size leading to challenges in processing. Fridley Public Schools was able to use The Good Acre for troubleshooting to overcome obstacles in order to serve great products to students. With the help of ongoing partnerships, Fridley Public Schools has been able to establish a successful Farm to School program that continues to grow. Including more farm to school vegetables has allowed staff to develop their culinary skills and has exposed students to new produce that is both fresh and local. Farm to School is a win-win! Trim ends of delicata squash. Halve lengthwise. Seed with a spoon. Slice into thin (1/2 inch) half moons. If using the Robot Coupe, use 10 mm (3/8") or 14 mm (9/16"). Line sheet tray with parchment. Preheat convection oven to 425. Mix olive oil, honey, salt, and Sriracha until well combined. Ingredients will combine for a thick sauce. Toss squash in mixture. Slowly add in the sauce until squash is covered. You may not use all the sauce. 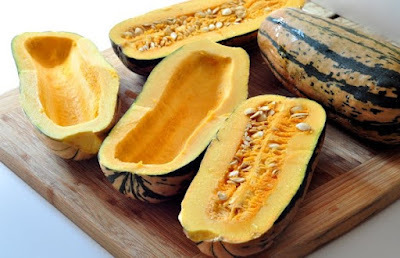 Bake at 425 degrees for 30-35 minutes or until squash is browned and tender. Final cooking time will vary depending on oven and load. Check frequently to avoid burning. Pans may need to be rotated. 1/2 cup = 4 slices (2.5 oz by weight). 20 lbs of cleaned squash is about 130-140 1/2 cup servings.